Buddhist Victory Banner Tattoos - One of the Eight Auspicious Symbols of Buddhism, the victory banner signifies Buddha's enlightenment through his conquering of passion, pride, lust, and the fear of death. These four pitfalls are known as the 'four maras', and are considered by Buddhists to be the hindrances we face on our spiritual journey. Liberation, or the state of nirvana, can only be realized when the battle over the four maras is won. In ancient times the 'victory banner' once implied a 'flag', but it would be a mistake to consider the Buddhist victory banner as such. It is a cylinder usually made of beaten copper. It is mounted on a pole and surmounted by a small white parasol. Billowing silken scarves of white and yellow were often attached. 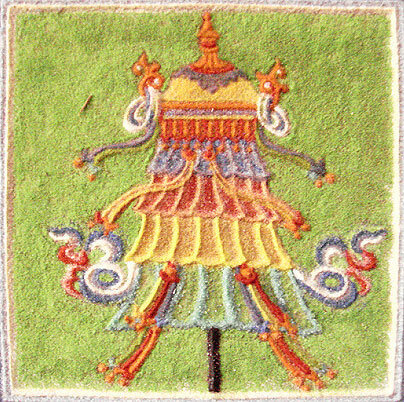 In Tibet, this 'banner' is traditionally placed on temple and monastery roofs, one on each of the four corners as a symbol of Buddha's victory over the four maras radiating in the four directions. Furthermore, a tiger skin may adorn the upper part of the cylinder, symbolizing Buddha's victory over anger and aggression. (For detailed illustrations see Handbook of Buddhist Symbols, by Robert Beer). After Buddha became enlightened, it was reported that he placed a victory banner on top of Mount Meru, which, according to sacred texts, was the axis supporting the world. By this act, Buddha was announcing that ignorance had been vanquished, and that the light of truth could now shine throughout the universe. The traditional 'victory banner' was in use in ancient India before Buddha's time (500 BC). It was a military standard that was carried in battle and displayed the insignia of its champion. Usually, it was set behind the great parasol in the war chariot. The insignia that appeared on Lord Krishna's victory banner, for example, was the monkey god, Hanuman.